Allen & Harris are pleased to offer this three bedroom end of terrace home, which offers the potential to extend. This is a unique opportunity to acquire a well situated property in need of modernisation. The house is located a short stroll from Larkhall village. Upon entry you will find stairs to the first floor leading off the entrance hall, along with access to the kitchen/diner and sitting room. The kitchen is fully fitted, but would benefit by being updated, giving you the opportunity to put your own stamp on it. The sitting room is of a good size and features a working gas fire. 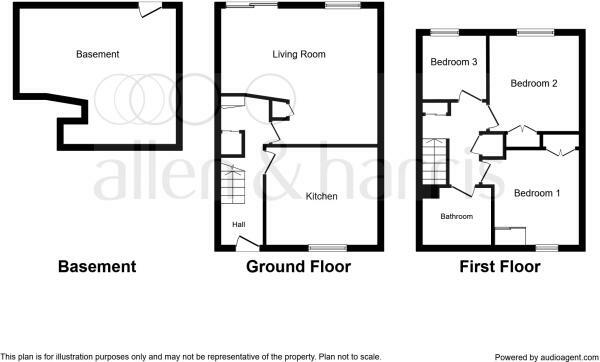 Upstairs are two well sized double bedrooms and a single bedroom, all providing ample internal storage. The family bathroom is practical featuring a bath with attached shower. Outside to the rear is a low maintenance garden laid to lawn with access to the under croft from the side of the property. Nearby schools include St Stephen C of E Primary, St Marks C of E and St Saviour's C of E Junior. You will also find a post office, the Fairfield arms pub along with a restaurant and health centre close by. Double glazed front door. Stairs leading to first floor. Doors leading to Lounge and kitchen. Double glazed window to rear aspect. Patio doors to rear. Gas fireplace with stone surround. Double glazed window to front. Fitted kitchen with wall and base units. Cooker point. Sink with mixer tap and draining unit. Space for fridge freezer. Space and plumbing for washing machine and dishwasher. Double glazed window to front. Two fitted wardrobes. Radiator. Double glazed window to rear. Built in cupboard. Radiator. Double glazed window to front. Panelled bath. Wash hand basin. Wc. Partly tiled walls. Laid to concrete, ideal for parking. Disclaimer - Property reference LAR103843. The information displayed about this property comprises a property advertisement. Rightmove.co.uk makes no warranty as to the accuracy or completeness of the advertisement or any linked or associated information, and Rightmove has no control over the content. This property advertisement does not constitute property particulars. The information is provided and maintained by Allen & Harris, Bath Larkhall. Please contact the selling agent or developer directly to obtain any information which may be available under the terms of The Energy Performance of Buildings (Certificates and Inspections) (England and Wales) Regulations 2007 or the Home Report if in relation to a residential property in Scotland.